It’s only the first day of the UCF Student Government Association Presidential Election, and already candidates Brad Keuhler, SGA’s Chief of Staff, and his running-mate, SGA Diversity Chair Breon Clark, have come under fire for a controversial Facebook post. 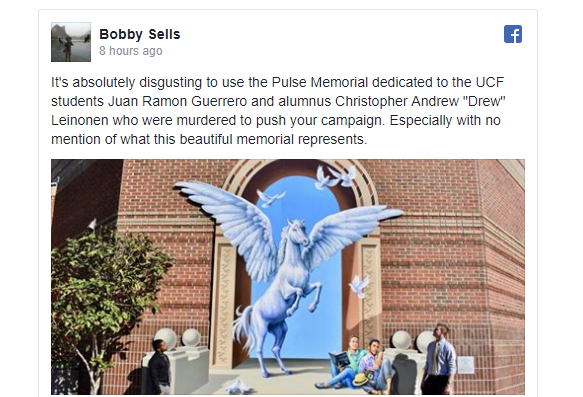 The candidates’ post in question entails a picture of the Pegasus Memorial on the wall of the Student Union on UCF’s campus, painted by local artists Michael Pilato and Yuriy Karabash, according to UCF. The memorial was painted in honor of the victims of the PULSE nightclub shooting, specifically UCF alumnus Christopher “Drew” Leinonen and his partner Juan Ramon Guerrero, whom he planned to marry, according to the Orlando Weekly. Brad and Breon’s Facebook post promoting their campaign, drew criticism from students. Some were upset because Brad and Breon did not mention any of the mural’s history — and in fact, made the false implication that the mural was painted by students themselves. Brad and Breon stated that they would continue to “advocate for more student-produced art”, and made no mention of whom the mural was dedicated to, or the themes surrounding it. A comment left under the picture by someone named Robert stated that the post was an “attempt to exploit a tragedy for votes”, which he called “disgusting”. Former SGA Speaker of the Senate, Crystian Cepeda, told Knight News he was bothered by Brad and Breon’s Facebook promotion using the mural “just to get attention” rather than find artwork done by students. Current UCF student Bobby Sells, who also has served in SGA, stated that he felt the post brought up important issues. Sells said he didn’t believe Keuhler and Clark had any malicious intentions, but that he felt it was their responsibility as student leaders to be knowledgeable about such topics. Sells stated that he stands in staunch support of the LGBTQ+ community, and as such believes the pair of candidates should address the public regarding the situation, and clarify whether the post intentionally left information out, or whether it was just a simple misunderstanding. Brad Keuhler and Breon Clark did not respond to a request for comment.